The clocks go forward on Sunday at 0100 GMTBritons and most Europeans have lost an hour of sleep this weekend after clocks went forward by one hour, marking the official end of winter. 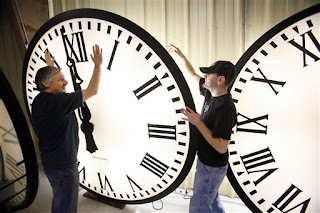 British Summer Time began at 0100 on Sunday, after which clocks had to be moved forward one hour to 0200. The change will mean darker mornings but lighter evenings. Daylight saving was suggested in 1784 by American inventor and politician Benjamin Franklin, to allow people to enjoy more light in the evenings. Protests over whether or not clocks in Britain should keep time with the rest of Europe continue into the present day.